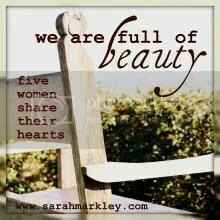 This week at www.sarahmarkley.com, Sarah invited us to write a post about beauty and what it means to us. I have truly enjoyed following the guest posts and their take on beauty. And, being guilty of blog stalking, I almost didn’t participate. After all, I don’t think of beauty in a conventional way. That’s not to say I don’t do my share of obsessing over hair, makeup and clothing choices, but I truly believe that beauty is a shining light from, not even from within, but from above. I have nothing beautiful within me without the reflection of my Lord. I am a broken vessel. Not a little broken either, but shattered really. Shattered into a million little pieces (mostly by my own doing), but gently…lovingly, put back together piece by piece by my most gracious Lord and Savior. It’s hard for me to admit to anyone that I don’t hold it all together, that I am not in control, that I am not always, and have not always been a…ahem…good person. That I need God’s grace and forgiveness not daily, but every second of every day. I don’t like saying that out loud. I am ashamed of my weakness. Recently, though, I have come face to face with this ugliness inside of me….God labeled it for me: broken. I am broken. And telling others about that brokenness, well, it’s really hard. But then, God showed me a picture of His love and of my beauty in it. 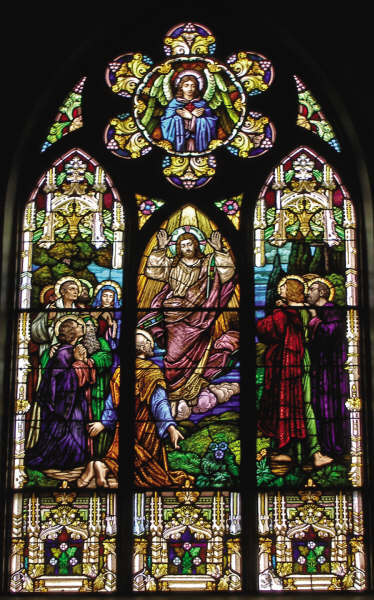 I was visiting with a friend of mine a one hundred year old church known for its stunning stained glass windows. I was in awe of the beauty of man’s hand in this place, and I remember noticing that one of the windows was cracked. “Just wait a few more moments…you will see.” He said with a small smile and walked out of the sanctuary. So my friend and I sat, and waited. As the sun crested at high noon, the room was set on fire with light. Hundreds, no, thousands of tiny rainbows danced on the walls and the floors. Colors everywhere, some I can not even describe, chased and swam over the altar and the cross. All that unexpected beauty from a single crack with the light of the sun shining on it. I realized in that moment that broken is beautiful…when the Light of the Son shines through the crack. Just as no other window will ever be able to recreate the effect that we saw that day, so no other person can ever tell my story of redemption. Will ever have my weakness to show God’s strength. Will ever be able to reflect God’s light in the way that I can. My brokenness…my shattered soul, carefully pieced back together can shine a million tiny little rainbows on the world…with God’s light. Now that’s beautiful! Beauty isn’t about having it all together. It’s about being brave enough to show the cracks to the world and let God shine His light through them…then we can all be as beautiful as splintered glass.